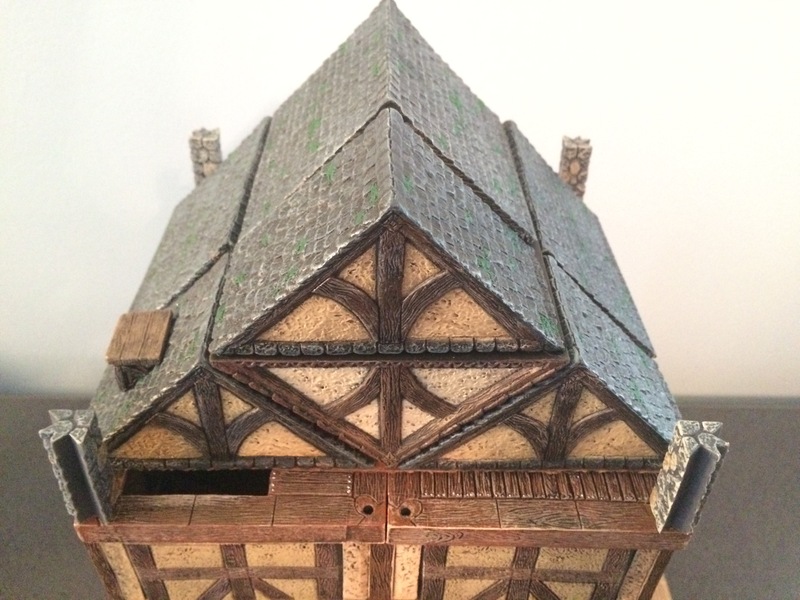 I assembled the roof of Scarlet Moon Hall by stacking multiple terra cotta and slate roof pieces. The peak pieces are supported by inverted roof pieces resting in the valley formed by the edge pieces. To prevent sliding, the roof pieces are stuck together using poster tack. The entire roof assembly is also stuck to a thick piece of cardboard to allow easy removal. The roof piece seen in the lower right hand corner is a magnetic piece holding a small, wooden perch. This represents the small scaffold section on the roof. The hole that can be seen in the floor piece below it represents the hole in the ceiling leading to that perch (in the picture above I have slid the roof back slightly to reveal that hole). I designed the roof to be not quite as deep as the rest of the keep in order to give the sense that it gets narrower on all sides as it approaches the peak (something the roof in the map and illustration do but isn’t possibly with the pieces I used). It also allowed me to utilize a mix of the full and half roof pieces. I chose the terra cotta texture as the exterior the go along with the idea that the attic itself might be mostly wood instead of stone.